Giving You a Bright Smile and Restoring Your Oral Health! At Serenity Dental Palo Alto, Dr. Heidari and the rest of our exceptional dental team are dedicated to giving you the healthy smile you deserve. We offer dental restoration procedures to improve the health of your teeth, tissue and gums that may have been damaged by decay, infection or trauma. Trust in our experience to help you solve these dental challenges efficiently and effectively. First, we perform a thorough examination of your mouth and evaluate your medical history. Then we give you a diagnosis of your condition and work with you to help you understand the treatment options available. Among the most common of these options are dental implants, dental bridges, dentures, porcelain crowns and porcelain veneers. The treatment we recommend depends on the extent of the damage your teeth contain. After we help return you to a solid state of dental health, we educate you on the best preventative methods so that you can avoid further issues in the future. 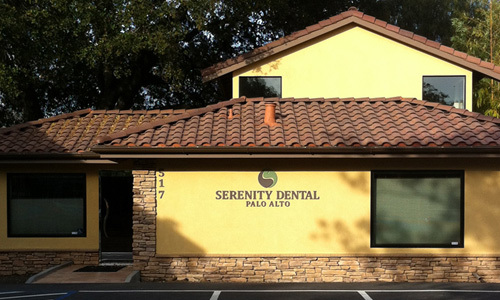 Let Serenity Dental Palo Alto work with you to restore your smile. Call our office for more information today at 650.327.7525 or email us at APPT@PaloAltoDentistry.com. If you are in or around San Jose, Los Gatos, Santa Clara please visit our San Jose Dental Dental Restoration page or call our office at 408.999.0444. We’re happy to answer any of your questions. We also offer dental restorations in Aptos, Santa Cruz, Capitola and Soquel. Please visit our Aptos Dental Restorations page or call our office there at 831.688.6531 for more information.